There is a large number of Singaporeans that are high income. They are those who start businesses, the corporate high flyers in thriving industries, the ones who worked the Singapore school systems who eventually got into good secure government jobs. They earn upwards of $80,000/yr. And they are the ones their peers put on the pedestal of where they wish to get to. Certainly, the cost of living in Singapore is not that low and with more income, it has the potential to increase the level of comfort for your family. However, to look at only the high income is like only measuring the performance of a business by looking at its revenue. There are expenses that could be substantial which you did not deduct away. Your feeble brain always assumes a higher income means inevitably a higher wealth buffer (difference between your cash inflow and cash outflow). This is not always true. If you are able to appreciate the cash flow statement of these individuals, you may realize that you are in a better position then them. Earning a high income, gives you a privilege of a great opportunity to be financially independent. However, not many can grasp this opportunity. We explain the link of your income, expenses to your ability to retire in a perspective provided by a fellow blogger. The context can be very different in Singapore, particularly the tax regime, but there are similarities. I always think that, other than the tax regime, what worked and doesn’t worked in the USA is very similar to Singapore. If you look at their personal cash flow statements, you will appreciate that life has a lot of expenses that can potentially be thrown at you. If you earn more, you spend more time at work, you also need services such as child-care, helper to buy more time. Most of the time, I look at things from the savings perspective. I realize that the majority of the folks look at savings as figuring out a responsible saving point, in order to spend the rest. (Read how much should you save in your 20s). 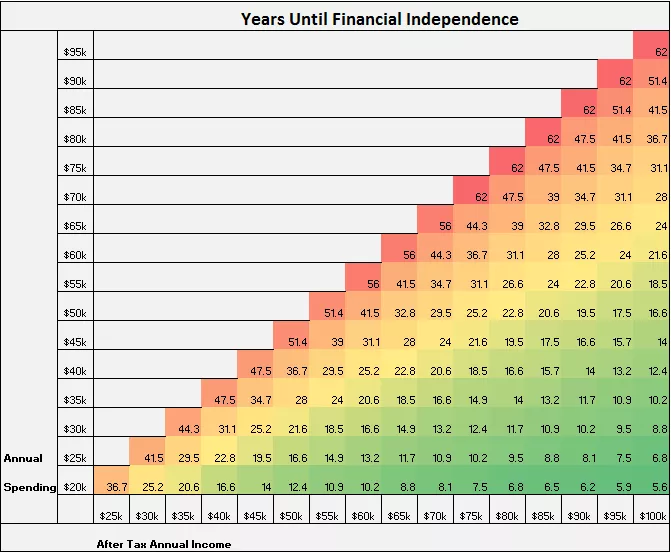 When Zack from 4 Pillar Investing presents his retirement grid, I thought its one of the innovative ways we can relate our spending to retirement. This grid has your annual after tax income on the x-axis, and your annual spending on the y-axis. If you earn 70,000/yr but you spend 50,000/yr, you can channel the 20,000/yr difference into building wealth. Zack assumes the rate of return to be 5%. During retirement, he assumes the “4% rule” or that if you draw down only 4% of your wealth in the initial year, and rising that annual retirement spend by inflation rate, your money will last a long time. This grid essentially compares your spending to your income to a goal that you might look forward to, which is retirement. This is a very common profile. This is the profile that fits the people that you look up to the most. On the surface they have high income. However, they work long hours as well. To build a family at the same time, together with their contribution to the extended family, the outlay could be drastic. So they could earn upwards of $100,000/yr after tax in disposable income but their expenses comes up to $85,000/yr. From the grid, they will take 41 years to retire. Zack’s illustration of assuming your retirement spending is similar to your current spending is subjective but somewhat realistic. The basis is that majority of us do not have a good view of our expenses,or a good control over our expenses. You are not going to drastically change your spending patterns. While you may have some lesser responsibilities when children became self reliant, you are likely to fill that by spending in other areas. The danger of dragging your retirement building over 41 years is that our job nature is getting volatile. Gone are the days where we can stay in a job for 20-40 years. The millennials cannot fathom staying in the same industry for so long. The older folks like myself are born in a time where we try to be single skilled. Thus when our industry goes into a decline, we will find our cash flow taking a hit and we have to cut away the cash flow meant to save for retirement. Employers would also prefer to hire younger, malleable workers than folks who have experience but may not be easily adaptable. This is one of the problems of saving small amounts over a small duration time span. A big group of my readers will fall into this group. They earn a competitive salary like the previous profile, but they pay attention to their spending more. Take the example of Kate and Dave from Minimalist in the City. While how much they earned is not known, they keep a good record of what they spend on for a family of 3 with contribution to their extended family. What I like about reading their expenses is that while they control their spending, and have a target for it, they still live a satisfactory life with holidays, rich life living. Someone with their profile could take home $100,000/yr and spend $50,000/yr. Based on Zack’s grid, they could reach retirement potential in 16 years. This is much shorter than 41 years. Most of all they are not sacrificing big for it. The bui bui forever alone is an urban Singapore concept popularized by Hardwarezone for a segment of Singaporeans who are not thin, socially awkward and tends to be single. Rumors have it that a large proportion of hardwarezone forum EDMW belongs to this group. As their requirements is low, they tend to have low expenses, since they stay with their parents. While some earned better wages and some earn lower wages, we can deduce a group of them would take home $50,000/yr and spend less than $20,000/yr. While this is not within’s Zacks, grid, if a BBFA falls into that profile, a BBFA can reach retirement potential in 12.5 years. You cannot save for retirement overnight. 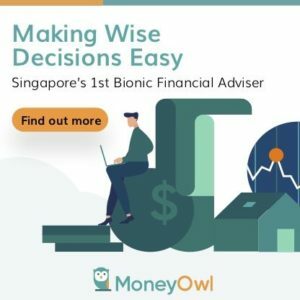 In the words of my friend Wilfred Ling at ifa.sg, if you are only starting to put away money for retirement after age 50 years old, you are going to have a serious problem. Your spending have a profound impact on your ability to save for retirement, and relates to your spending in your retirement. I really enjoy the posts that you have written. Although usually its very long, but the points are concise. I am a single income earner in the IT industry and was early 40s this year with take home pay near to 3.2K. Having to support a family of 4, 2 young child 2 & 6 and a non-working wife as well as both parents. I find it not easy to cut expense and survive at such a salary. Have tried to switch into different jobs and but at current age its not easy. Thus have been looking into investment as a possible way to boost cashflow but due to limited possible savings the results is not great. Have thought of possibly of letting my wife to work, but as she is a foreigner with little education, her expected pay might not be enough to cover expenses sending my younger child to childcare. Do you have any suggestion/advice or have known someone readers with similar situation and able to escape the rat race? Surprised to see that no one had reply you after almost a year, and was hoping at least the author would. I feel for you and could identify to some extent as my parents were also single income family when we were young which is normal in the 1970-80s. Well, even though I’m a certified advisor I would just share on personal level how you could make the most of your family situation. Your children could be better off if still taken care by your wife till they all enter primary school before she starts to find a job. That way she can concentrate on her career, meanwhile she should polish up on her English as most jobs required basic English in Singapore. Living in the most expensive city means you have to be creative to provide best value for your family. One is by checking on subsidies, bursaries and any NGO support. Forget about investing at this moment as the strain and even worst if a financial crisis hit, even an emergency fund which u supposed to have, may be wiped out. Investments are money one could afford to lose! As for jobs, do go for stability till your financial situation improves. A bird in hand is better than 2 in the bush. Do upgrade where possible and rise through the ranks, which maybe slow but steady. To be crude, there is no escape to this rat race in Singapore for most commoners like us, unless you have great connections or in a niche industry where your skills are one in a billion! Not to be negative, however, you should stay practical and do your best in your situation. Who knows the silver in the dark clouds may depend upon you one day!